What Is the Story of Evita? Andrew Lloyd Webber and Tim Rice’s Evita charts the rags-to-riches rise of the First Lady of Argentina, who won the love of her countrymen after marrying military leader-turned-president Juan Peron. Set in Buenos Aires between 1934-1952, the musical follows Eva Duarte Peron on her journey from fatherless child to ambitious actress to the most powerful woman in Latin America—and, eventually, to a saint-like figure after her death from cancer at age 33. 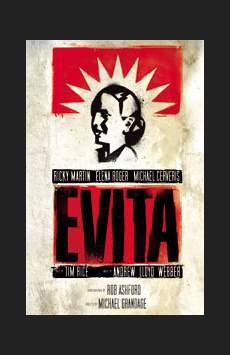 The events in Evita’s life are presented in song and editorialized on by the show’s narrator, Che.